Google Maps has the Port Authority schedules built in; that means to find a bus/T route, all you have to do is go to your Google Maps app or maps.google.com and type in the starting and ending destination. You also have the ability to change your departure/arrival time. The route will then be all mapped out with walking and riding instructions. Google Maps will not necessarily tell you where the Park and Ride lots are though. The lots let you park (some for free, some paid) and then hop on the bus/T. These lots normally fill up quickly so plan to get to the lot early for a spot! You can find out more about Park and Ride locations at Port Authority’s website (http://www.portauthority.org). Fares are based on a zone system, if your trip only brings you through one zone, the fare is $2.50 but if you pass through two zones the fare is $3.75. In downtown Pittsburgh there’s a free fare zone, referred to as the Golden Triangle. All of downtown Pittsburgh and some inner-ring suburbs are part of Zone 1 and the rest of the locations throughout Allegheny Country are in Zone 2. Port Authority has fare cards called ConnectCards that can be purchased at a Port Authority office, or even Giant Eagle, and can be refilled online or at ConnectCard machines. A ConnectCard can be used on any Port Authority bus/T line and gets rid of the hassle of carrying exact change. One of the best parts of taking public transportation is being able to read a book, watch Netflix, play on your phone, or even sleep during your commute. Take advantage of this time! 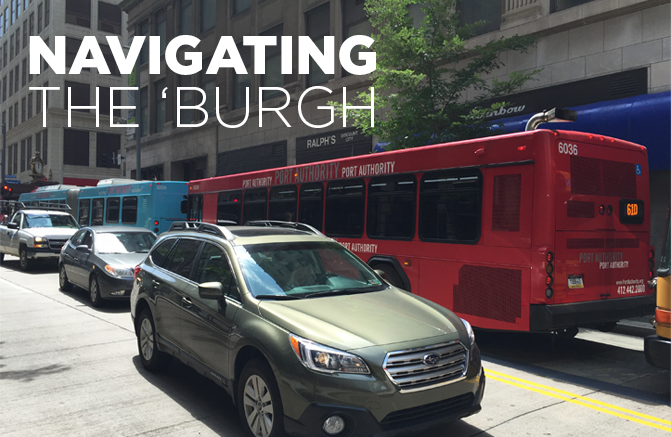 I’d recommend using the transit system as a solution for daily commute as well as a great way to get to the Summer Associate activities, like the Pirates baseball game and various service sites!